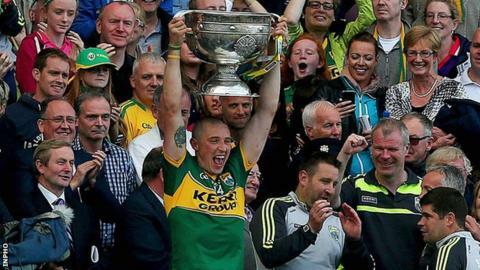 Four time All-Ireland winner Kieran Donaghy has retired from inter-county football at the age of 35. The Austin Stacks clubman made his Kerry debut in 2004 and went on to play 69 championship matches for the Kingdom. "The journey has been full of ups and downs but I never wanted it to end," said the full-forward on Tuesday. "It has surpassed even my wildest dreams." Donaghy's breakthrough year came in 2006 when he played a pivotal role in Kerry's All-Ireland winning campaign, scoring 1-02 against Mayo in the final before being named Footballer of the Year. The three-time Allstar lifted Sam Maguire three more times, in 2007, 2009 and 2014, and won eight Munster Championships. "To get the opportunity to soldier with and against some of the greatest players of all time is something I will always treasure," he reflected. Having started his football career as a midfielder Donaghy's move to the full-forward line proved to be inspired as he soon gained a reputation as one of the most physically dominant forces in the game. "He has been a totemic figure for Kerry since he broke into the team in 2006 and has lead from the front since," said former Kerry manager Éamonn Fitzmaurice. "He book ended his career by re-energising an ailing group in 2006 and inspiring a new group in 2018." Kerry exited this summer's championship in the Super 8s following defeat against Galway and a draw with Monaghan.